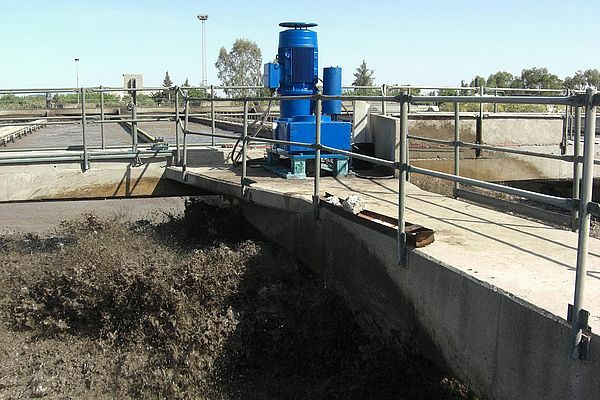 In the Tunis waste water treatment facility, the contents of eight pools are stirred by robust drive units. The low-maintenance helical shaft gear units are operated with a synthetic oil lubricant and thereby resist even high ambient temperatures. In water works and waste water treatment facilities, pumps often have to process great amount of liquid. High-performance drives are therefore necessary for smooth operation. In such applications, drive units are often subject to extreme environmental conditions, and must be designed accordingly. But in addition to climatic conditions, other factors also play a great role in the choice of the drive technology supplier. The following article explains how the total cost of ownership needs to be taken into account in this case, and how savings in the wrong place can result in considerable additional efforts and expenses. 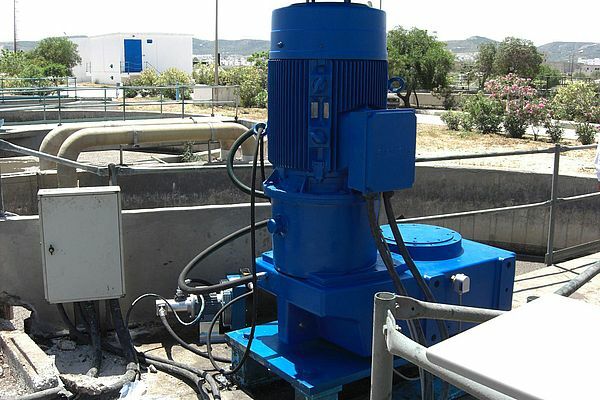 The waste water treatment plant in Tunis, which is operated by public enterprise ONAS (Office National de l'Assainissement), has eight pools in which mixers powered by two large geared motors ensure steady circulation. Thereby, the waste water is oxygenated, enabling the decomposition of dirt particles through bacteria. The plant supplies Tunis and its metropolitan area with process water, covering the needs of approx. 2.5 million people. It features drive technology that is nearly 30 years old and must be replaced step by step. A robust design is a must for new drive solutions, since the units are installed outdoors and operate non-stop while the temperature fluctuates considerably. In winter, the temperature can drop to -5 °C, while up to 45 °C is possible in summer. Up to now this has frequently affected the lubrication of the originally installed gear units, requiring maintenance to a problematic extent. The goal was therefore to implement lower-maintenance drive solutions which are well-suited for extreme environmental conditions. 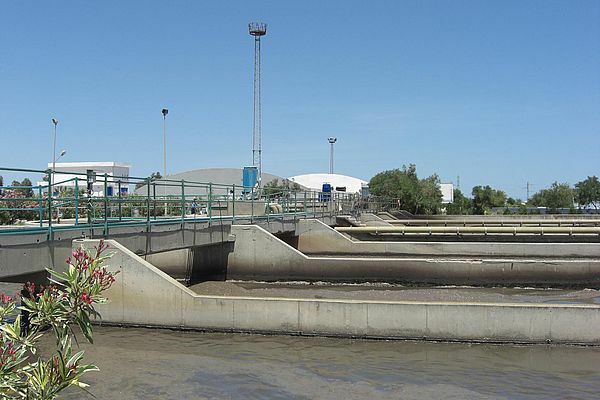 The original drive technology equipment in the Tunis waste water treatment plant was supplied by manufacturers from South and West Europe, which traditionally have closer ties to Tunisia than German manufacturers. However, the units that need to be replaced now have been discontinued, which means that spare parts are becoming increasingly scarce and lead times are becoming longer. This fact contributed to the decision to find a new supplier, which is where drive systems expert Nord Drivesystems from Bargteheide near Hamburg, Germany, came into play. The company has been operating a sales office in Tunisia since 2003, which had already successfully implemented some smaller-scale projects. Drive technology from Nord, which is slightly more cost-intensive than comparable products from competitors, requires considerably less maintenance, thereby minimizing operating costs and optimizing the availability of the plant. ONAS wished to benefit from these advantages. During the course of 2009, the drive system expert delivered two combinations of Nord helical shaft gear units and Siemens motors which have since proven themselves during continuous operation. Nord uses a high-quality synthetic long-life lubricant for the helical shaft gear units. It withstands the ambient temperatures considerably better than mineral oil - with the latter, the oil film would break down at high temperatures, resulting in increased wear and tear. Each gear unit requires 210 l of oil which have to be changed after approx. 20,000 hours of operation. Other manufacturers often stipulate shorter maintenance intervals, which makes a considerable difference at a price of 10-18 € per liter. An oil cooling system additionally increases operational safety in the Nord gear units: a temperature sensor constantly monitors the temperature of the lubricant and activates the cooling system as soon as a configurable limit is exceeded. In this application, the limit is 60 °C. Heated oil is then pumped out, cooled by an oil cooler and returned to the gear unit. When the temperature falls below 40 °C, the cooling system switches off automatically. Currently, two helical shaft gear units with a 132 kW performance from Nord 's SK 12382VZ series are installed at the waste water treatment plant. They are combined with Siemens motors via IEC adapters. Nord 's helical shaft gear units are available as two- or three-stage basic types with hollow or solid shafts, in foot mounted, flange mounted, or face mounted versions - each with the same housing. Suitable for integration into limited installation spaces, they can be combined with many components from the modular Nord system. ATEX models and models with IP55 or IP66 protection are available on request for all types. All gear units are manufactured according to the UNICASE concept, originally developed by Nord in 1981, which enables maximum performance for small gear dimensions and ensures operational safety, high efficiency, high output torques, high resistance to axial and radial loads, low-noise operation, low maintenance and a long lifetime.